The SV90 Security Degausser is able to perform automatic degauss of high-density magnetic media achieved by applying a highly focused magnetic field created by the exclusive multi-axis, 'pole tip' design. The tapes or cassettes are placed in the drawer compartment and rotated within the powerful 7000 Gauss field ensuring uniform and complete erasure. 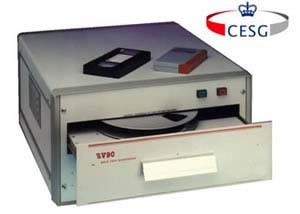 The SV90 degausser can cope with a range of media including tapes of up to 16 inches diameter. Up to fifty reels or two hundred cassettes can be efficiently and quietly erased per hour, the SV90 bulk eraser operates continuously and is quiet, cool and efficient. Currently the SV590 is approved at the Lower Level. This means any magnetic media (holding RESTRICTED or less) may be regarded as NOT PROTECTIVELY MARKED after being degaussed. The SV90 is subject to S(E)N 06/09. which requires all the SEAP-approved degaussers to be retested against the new CESG Degaussing Standard (at the Higher Level). At this time, the testing standard is not yet available. The SV90 security degausser may still be used to degauss magnetic media at CONFIDENTIAL and above, but the degaussed media is subject to additional handling requirements (detailed in S(E)N 06/09). The SV90 security degausser has been approved by the UK Government and meets the specified requirements of CESG Degausser Standard for the secure erasure and destruction of information and data stored on magnetic media up to the restricted and below level. Also meets German security approval DIN33858.